Finding a lawyer with any sort of specialty that is right for you can be difficult. 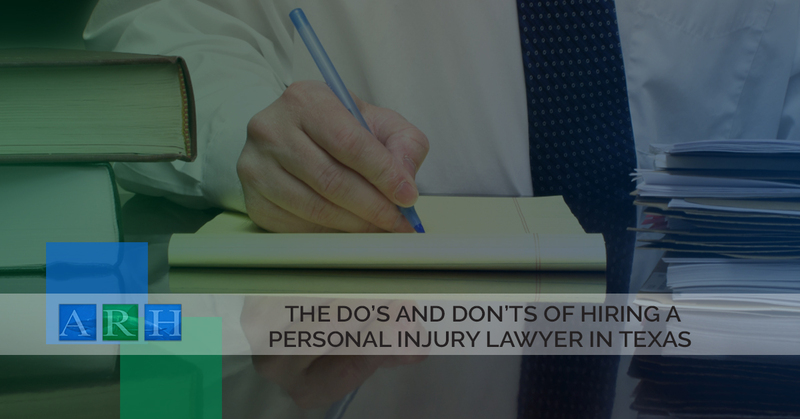 When it comes to finding the right personal injury lawyer to take on your case, there are things you should do and things you shouldn’t do before agreeing to let someone represent you. Below you can find an in depth list of what you should and shouldn’t do when you need an accident attorney on your side. We’ve said it before, but we will say it again. When hiring an attorney, you need to know what your options are and doing research is the best way to know what you can expect from any legal office before hiring them. Additionally, be sure to research individual lawyers who work at the firm so you can know who you would or would not want working on your case. Online reviews are a great way to get a sense of whether a law firm can be trusted or not. If people have a poor experience with a lawyer, they will absolutely go to the internet first to write their grievances. On the other hand, if people have a great experience with a lawyer, you can bet they will be raving about them online as well. You want to know that the attorney you are going to hire has a good track record. After all, you wouldn’t want to hire someone who has never won a case. That doesn’t give you a ton of assurance that your case will end well. You should always keep your options open when you first look for a personal injury attorney to represent you. Committing too early could come back to cause you a lot of trouble in the long run, especially if you didn’t do your research thoroughly enough in the first place. You should always read your contract front to back, several times before you ever sign one. Not doing so could lead to unknown fees or worse as you get deeper into your case. Only take awards into consideration. While there are certainly some prestigious awards that will absolutely prove to you that the law firm you are considering is legitimate, there are others that don’t hold as much weight. Be sure that the awards a law firm is claiming are reputable and after that continue to research the lawyers at that law office. Picking an attorney solely based off the awards they claim to have received is never a good idea. Get pawned off on an associate. Before you agree to hire a lawyer, you need to make sure that the lawyer you are hiring will be the main person working on your case. Many times, lawyers will pass off cases that are not high profile to their associates if they think they don’t have time to handle their workload. Ensure that the lawyer you are hiring will be invested in your case, or at the very least that their associates are more than capable of handling any overflow work that may come up. Hire an attorney who approaches you. Never ever hire a personal injury attorney who approaches you. Case running is not only unethical but it is illegal. An attorney who conducts business like this is not to be trusted, and therefore someone you don’t want representing you. Have a bigger is better mentality. Just because a law firm is larger doesn’t mean it’s good. You need to take an individualized approach and consider each attorney at the firm on their own before looking at the firm as a whole and choosing to hire them. We feel that this probably goes without saying, but do not hire a television lawyer. You won’t get the service or the results you want from your case should you choose to hire one of these TV personalities. Need a Personal Injury Lawyer in Texas? If you are looking for an accident attorney who you can absolutely trust, it’s time for you to call Alex Hernandez Trial Law today. Our competent and passionate lawyers are here to help you get the results you want from your personal injury case.